In today’s highly populated world catching attention of others is very difficult, especially in field of education, sports, etc. Because numerous world records are already being created. So, the only thing which left for such people which want to become famous over nights is to do something totally different work by crossing limits, either funny, insane, etc. But in this news instead of individual, multi thousand people of Sweden participated for setting up a unique type of world record. According to the news, 2493 people with wearing dresses of different type and colors gathered and formed the world biggest hand gesture. The gesture is similar to a thumbs up icon which is use to express status LIKE of world most popular social website Facebook.com. All of the public stand so closed by sharing shoulders on ground covered by snow which give a white background, but they missed color coordination by not wearing Blue dresses by all. 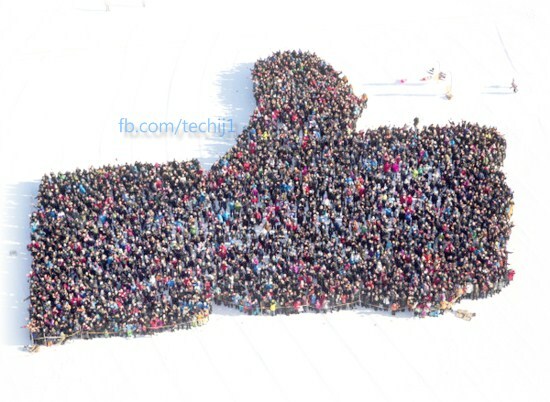 This man made Facebook Like icon covered several feet’s of area and helicopter is used to take its full top view. Well its bit difficult to tell is it sponsored by Fb or just an idea of any passionate, which gathered all these people as volunteer.